Castor raises a lot of controversy from people. Some are categorical and require to forbid to plant a plant in an area where there are people, to avoid the slightest contact. And other lovers of flora lightly cultivate the plant in your garden, often with him in contact, multiply and offer seeds to friends and family. Most often this happens from ignorance. Not all know exactly what is a poisonous plant of the common castor-oil plant, some of it can be benefits and harms. Castor oil plant is a very poisonous plant, which was brought to us in the nineteenth century, from distant India. This plant quickly became popular and was grown on large plantations for technical and medical oils. Castor-oil plant is now cultivated in many areas for decorative purposes. She has beautiful large leaves green or Burgundy and seeds, which resemble furry balls. Many people are not even aware that the plant is very poisonous and I think its normal colors. Even now, out of castor bean oil to produce lubricants that are used in aircraft structure. In addition, the tree provides a castor oil soap, leather and paint industry. Castor oil plant is widely used in pharmaceutical manufacturing. The raw material is added to the Vishnevsky ointment, medications for the treatment of the mucosa of the throat and medicines for the treatment of urolithiasis. This oil effectively eliminates constipation and protects gastric mucosa in different types of poisoning. Castor oil is an essential plant oil which comes in many medicines. Replacing him almost impossible to find. Ricin is the most toxic part of the plant. This substance is present in the seed coat. Therefore, the consumption of beans of the castor plant poisoning occur that are incompatible with life. Dulls the vigilance of the appearance of the seeds of the castor bean, they look like beans. Ricin is, and in all other parts of the plant – leaves, stem, seeds, and processed products. In the flowering period the amount of ricin decreases in the leaves, and is concentrated in attractive colors. Lethal dosage beans of the castor plant for adults is considered to be 20 pieces, to be fatal, the child will be enough for 5-6 pieces. It is unlikely that a grown educated man would just eat the seeds of suspect plants. The situation is completely different if the castor is in contact children of different ages. Their insatiable curiosity leads to irreversible consequences. Mass poisoning castor often occur in family boarding houses and health camps, where the style of these beds is high and succulent plants. Mostly they planted entire plantations, and therefore cause a genuine curiosity in children. Animals that has ever tried this plant life pass away. Animals can die when eating the cake, after processing the beans of the castor plant. Some teenagers are recommended to each other castor beans as a light drug. This can lead to overdose and death. Ricin poisoning is manifested by specific symptoms, which are difficult to confuse with other types of poisoning. What is most dangerous is that symptoms of poisoning appear after a while and many of them do not associate with eating seeds. Even an adult might not remember that he tried the seeds of the castor bean taste, not to mention a small child. fever, in some people, it reaches catastrophic levels. Ricin provokes the adhesion of erythrocytes, due to which the disturbed blood supply to all organs and tissues in the body. Capillaries are clogged by blood clots seen on the skin hemorrhages and ulcers. Develop internal bleeding, all major organs and systems are fully paralyzed. The overall picture of this intoxication is very similar to toxic shock. 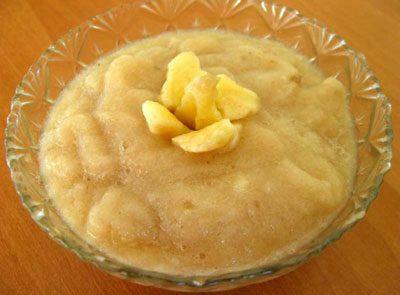 The toxin contained in castor, completely destroys the capillaries. First destroyed the mucous membranes of the digestive organs, they begin to bleed. In the vomit or faeces there is a significant part of blood. Kidneys, in the urine revealed red blood cells and protein is the first symptoms of the destruction of the blood vessels in the kidneys. Develops bleeding in the lungs. General intoxication of the organism steadily increases, in spite of the treatment. If there is bleeding in the brain, the person loses hearing, there may be loss of consciousness and convulsions. If the human body receives a small dose of ricin, the symptoms of poisoning similar to alcohol or drug intoxication. But the brain cells are already experiencing oxygen deprivation and begin to die. In the use of the poison ricin man dies after a week due to complete paralysis of all organs and systems. Give the adsorbents. Helps powder activated carbon, which is dissolved in a weak solution of baking soda. Do a cleansing enema, which take a little salted water or a solution regidrona. For enemas you can use water at room temperature, more hot water promotes the absorption of toxins into the bloodstream. After washing the stomach and intestines give the victim any laxative and enveloping means. Because drugs give enterosgel, if it is not in the house, then it is your regular jelly, banana puree, raw eggs or decoction of flax seeds. To minimize the local impact of ricin on the body, the patient well washed eyes, nasal passages and mouth. This can be done as a regular drinking water and a weak solution of baking soda. The leather is treated with any alcohol-containing drug. Despite successfully given first aid, a medical team is summoned to mandatory, probably because the deterioration of the patient. The patient in this type of poisoning hospitalitynet for treatment. Transportation of the patient is carried out in a sideways position to avoid getting vomit in the respiratory system. 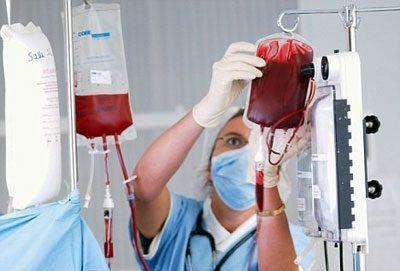 If necessary, perform a blood transfusion. Shown intravenous infusion of saline and glucose. Abdominal pain in cases of poisoning by castor-oil plant so strong that it may develop a state of shock and the person dies. To stop such attacks can only drugs. When violation of the kidney drugs that stimulate discharge of urine. Gives good results treatment with oxygen. With this type of poisoning is impaired blood circulation, which means that all cells suffer from a lack of oxygen and eventually die. The victim is constantly under the control of the ICU doctors performed supportive therapy and symptomatic treatment. 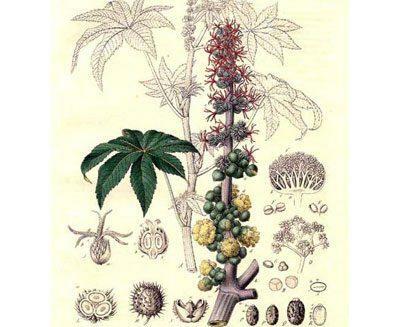 Treatment of intoxication which provoked the castor oil plant, is a very complex task even in the hospital, in the presence of modern equipment and medicines. Usually dysfunction of one organ starts to fail in other important organs and systems. A catastrophic situation is developing in a very short time, as though the doctors tried, they often lose in the struggle for life. Even if a person manages to save the internal organs will no longer function as before. The person is left with chronic diseases or disabilities for life. Increasingly, the hospital receives little children who were poisoned by the seeds of the castor bean. The most terrible that is possible to save units remaining children die within a short period. It must be remembered that the antidote to ricin, which contains the castor, no. This plant is a great danger to adults and children and should therefore be avoid. Not plant to plant in the flowerbeds and in the area where children walk. Inform neighbors and relatives about the dangers of this plant. Teach children preventive discussions on the prevention of eating unfamiliar seeds. To follow children and adolescents. Stealth, irritability and aggressiveness should be the signal to refer to a qualified psychologist. 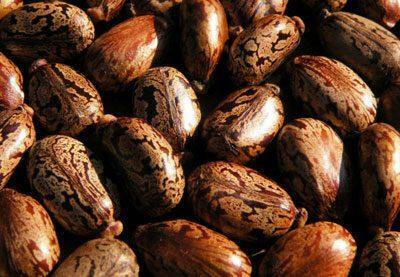 Do not store in an accessible place castor beans, these beans it is advisable not to collect. 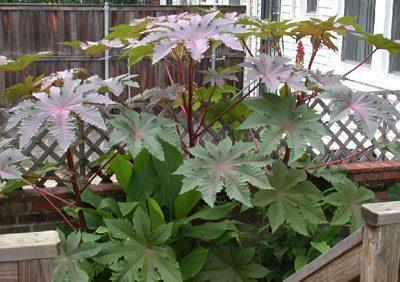 In the summer walking around the city, it is hard not to meet castor-oil plant, which is planted in the flowerbeds. It is an attractive plant with fleshy leaves of the original form truly becomes decoration of any garden. But beauty can be deceiving. Castor oil plant is very poisonous plants, poisoning his beans man waiting for death or disability.